How to spec a Mazda 6 | What Car? Mazda has gone for a 'clean sheet of paper' approach with the latest Mazda 6. The new 6 has been developed using Mazda's Skyactiv technology, which focuses on reducing weight and improving the efficiency of conventional combustion engines, rather than resorting to hybrid powertrains. It has the likes of the BMW 3 Series and Ford Mondeo in its sights, but with a range of bodystyles, engines and trims to choose from, picking the right one takes some thought. Here's how we'd spec a Mazda 6. 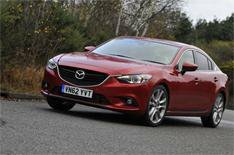 Should you buy the Mazda 6 estate or saloon? The new Mazda 6 won't be available as a hatchback, so if you regularly need the extra practicality that would be offered by that body type, you'll be better off going straight for the 6 Tourer. Remember, though, that estate versions do take a modest hit in fuel economy and CO2 emissions, as well as costing more to buy in the first place - so you should weigh up how much you really need the extra 33 litres of load capacity (or around 1100 litres with the estate's rear seats folded down) before committing. The entry-level model is a 2.0-litre petrol with either 143bhp or 163bhp - although both versions have the same amount 136lb ft of torque. You'll find yourself working the engine pretty hard to keep the big 6 going at a reasonable pace. Even with relatively modest CO2 emissions of 129g/km (143bhp version), this won't be the cheapest engine in running costs. The diesels make more sense. Again there's one engine, a 2.2-litre unit, and it's offered in a couple of states of tune, with 173bhp and 148bhp. The lower-powered version is our pick; it doesn't feel all that much slower in the real world, because it still has 280lb ft of torque (compared with the more potent motor's 310lb ft) - and best of all, it offers CO2 emissions of just 108g/km when paired with the standard six-speed manual gearbox. That puts the 6 in a lower tax band than even the cleanest Ford Mondeo, and makes it a very appealing company car. Which trim level should I choose? There are three basic trim levels - SE, SE-L and Sport - although all of them are also available with the 'Nav' suffix that brings Tom Tom-based satellite-navigation. SE has 17-in alloy wheels, manual air-conditioning, daytime running lights, a 5.8-in colour-screen infotainment system with USB connectivity, integrated Bluetooth, electric windows all round and cruise control. SE-L adds rain-sensing wipers, privacy glass for the rear windows, dual-zone climate control, a couple more speaker, and parking sensors front and rear. Sport switches the wheel size to 19 inches, and also brings bi-xenon headlights, keyless entry, LED daytime running lights, a reversing camera, leather trim, heated front seats and a six-way adjustable driver's seat with memory function. Our preference is SE-L Nav, which brings plenty of toys, including that Tom Tom-based navigation, but sticks with 17in wheels. The ride quality, and road noise, become a bit of a pain on the Sport spec's 19-inchers. Which transmission should I go for? The new Mazda 6 is offered with a choice of six-speed transmissions, manual and automatic. Unless you absolutely cannot live with three pedals, we'd opt for the regular stick; it's a pleasant enough gearbox, and brings considerable efficiency and performance benefits. You'll pay more to buy and run the auto, and it's not the smoothest of transmissions at low speeds. There are relatively few options, and most of those that are available aren't really worth considering. Regular metallic paint will set you back 520, the appealing Soul Red' metallic is 660, and two Sport-specific options - lighter leather, and a Safety Pack that includes blindspot monitoring and a lane-departure-warning system, cost 200 and 700 respectively. The Mazda 6 is still too new to be attracting discounts, so our Target Price remains the same as the official list figures for now.